The introduction of non-native invasive aquatic plant and animal species to the United States has been escalating with widespread destructive consequences. 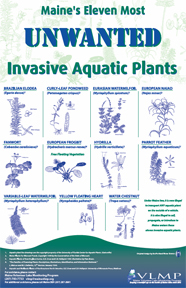 The impacts of the spread of invasive aquatic plants are well known: habitat disruption, loss of native plant and animal communities, reduced property values, impaired fishing and degraded recreational experiences, and enormous and ongoing control costs. With over 6000 lakes and ponds, and thousands of miles of stream habitat, the task of preventing the spread of invasive aquatic species (IAS) in Maine waters is one of the greatest environmental challenges of our time. Invasive plants and animals are moved about in complex and often unseen ways, and the speed at which a new introduction can explode into an ecologically and economically disastrous infestation is well documented. Once an invader is well established, eradication is extremely difficult and costly, if not impossible. Prevention is the first step to fighting this invasion, but no matter how comprehensive and aggressive our statewide prevention effort, chances are some invasive organisms will slip through the cracks. In such cases, it is crucial that the invaders are detected as early as possible, before they have had an opportunity to cause significant damage or to spread to other waterbodies. Early detection provides the best hope of eradication. The critical role volunteers play in this effort cannot be overstated! As awareness of this threat to Maine waters has emerged across the state, Mainers have taken swift and decisive action. In 2000, the State of Maine passed legislation that outlaws the sale, propagation, or introduction to Maine waters, of eleven invasive aquatic plants. Currently, five of these “outlawed” plants are known to be established in Maine waters: variable leaf water-milfoil (and a hybrid form of this plant), Eurasian water-milfoil, curly-leaf pondweed, European naiad and hydrilla. In 2001 further legislation was enacted, instituting additional regulations, programs and planning requirements. In addition to establishing a dedicated funding mechanism to support statewide efforts to address the threat of invasive aquatic species, the new law established an Interagency Task Force on Invasive Aquatic Plants and Nuisance Species. The Task Force, comprised of state agency personnel and private citizens representing diverse stakeholder interests, quickly got to work on Maine’s Action Plan for Managing Invasive Aquatic Species, a federally approved plan that provides guidance for statewide action in Maine. One of the primary goals laid out in the plan was the development of a practical and effective statewide early detection system. Case studies of infestations throughout the US indicate that once invasive plants become well established in a lake, stream or pond, they are nearly impossible to eradicate. A comprehensive, ongoing effort to prevent the introduction of aquatic invaders to Maine waters, through public education and Courtesy Boat Inspections is, and should remain, a top priority. But Maine is a large state, and despite our most aggressive efforts to ward off new infestations a significant probability remains that an invasive plant will manage to slip through the cracks. Early detection of a new infestation provides the best hope of eradication. In cases where eradication is not possible, the earlier an infestation is detected, the greater the chance that the invasive plants can be managed effectively using low-impact methods. Maine needs an effective, statewide early detection system designed to screen the millions of acres of aquatic plant habitat on an ongoing basis. Trained volunteers play an extremely important role in Maine’s early detection effort. 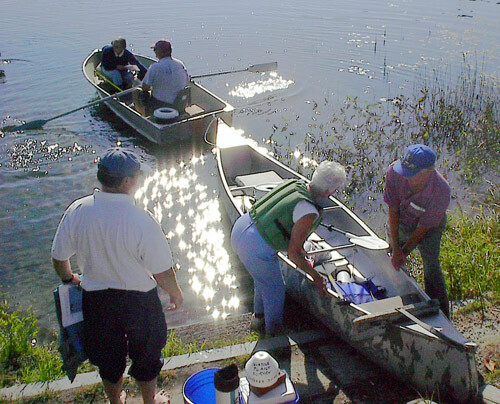 Since the first Invasive Plant Patrol (IPP) workshop in 2002, the LSM has trained thousands of individuals to screen Maine waters for aquatic invaders. 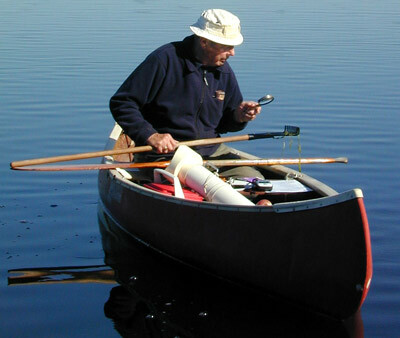 The program was specifically designed to engage widespread participation by individuals with varying amounts of time and expertise to commit to the endeavor, from those who simply want to be more knowledgeable when they are out recreating on their lake, to those who are conducting and leading comprehensive lake-wide surveys.